The USGS has issued its now annual seismic-hazard forecast for the central and eastern United States. The updated maps, which highlight both natural and human-induced earthquakes, show that millions of Americans are likely to feel the earth shake beneath their feet over the next 12 months. The new maps show that four million Americans—the majority of which live in Oklahoma and southern Kansas—are at serious risk of having their homes or workplaces damaged by a magnitude 4.0 or greater earthquake in 2017. While slightly fewer quakes are predicted to occur this year compared with last year, troublingly, the vast majority will be triggered by human activities, namely the oil industry practice of injecting wastewater deep underground. The new forecast maps show how our appetite for fossil fuels is changing America’s seismic landscape, and how difficult it will be to predict quakes in the future. By order of Congress, the US Geological Survey is required to report on earthquake hazards. In the past, this entailed USGS scientists projecting potentially dangerous seismic activity well into the future, using time scales around a half-century, and only considering naturally-caused earthquakes. But since 2008, certain parts of the United States have been rocked by swarms of earthquakes, the vast majority of which are caused by the practice of disposing oil and gas field wastewater deep underground. A decade ago, about one or two earthquakes struck regions that are now getting hit by several thousand earthquakes each year. In response to heightened seismic activity, last year the USGS began issuing annual earthquake forecasts to warn Americans of potential risks. The new map, published in Seismological Research Letters, shows the relative damage risk stemming from both natural and human-induced earthquakes. Because these projections are limited to the next 12 months, and because the vast majority of the quakes to be felt in the coming year will be the result of human activity, the new maps look dramatically different than the long term national seismic hazard map, which includes rare and powerful events that happen on centuries-long timescales. Accordingly, the one-year projections map is primarily limited to those areas in which wastewater and fracking are common, and where the local geography is most vulnerable to human activities. It’s wholly possible that a major fault might slip in California this year, but the USGS scientists say it isn’t likely. Areas at highest risk of an induced quake—that is, a human-caused earthquake above magnitude four—include Oklahoma, southern Kansas, and the Raton Basin (an area in Colorado and New Mexico), where about 3.5 million people live and work. The USGS says an additional half million people are at risk from natural earthquakes, bringing the total number of people at risk from both natural and induced earthquakes in 2017 to about four million. USGS maps comparing forecasted damage from natural or human-induced earthquake in Oklahoma in 2016 and 2017. The USGS research considers a magnitude 2.7 earthquake to be the level at which ground shaking can be felt, and an earthquake of magnitude 4.0 or greater is typically required to cause noticeable damage. In areas designated the Red Zone, residents and planners are being told to expect quakes that are strong enough to crack and cause minor damage to structures. The New Madrid Seismic Zone (NMSZ), a source of quakes for several states in the southern and midwestern United States, has been listed as a high hazard zone. It’s the only region without induced-quakes that has experienced an increase in the rate of natural quakes in the past three years, raising its hazard potential slightly. If there’s any good news in all of this, the updated maps project fewer earthquakes this year than in 2016. The forecast decreased because fewer quakes were felt in 2016 than in 2015. At a press conference held earlier today, USGS official Mark Petersen attributed the projected decline to regulations that limit the amount of wastewater that can now be injected underground, and to decreased production owing to lower gas and oil prices. To compile their one-year forecast, USGS scientists and engineers consider only the most seismically active areas on a short term basis. Areas with frequent tremors are flagged as being high-risk. Needless to say, there’s a lot of uncertainty tied to these projections, particularly as energy industry practices and regulations are subject to change. 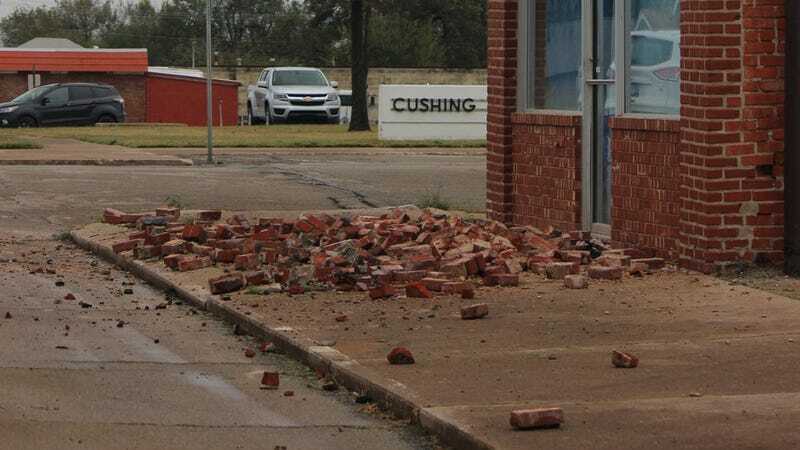 Last year, Oklahoma experienced some of the strongest earthquakes ever recorded in the state, including three over magnitude five. So while fewer quakes were felt last year, the ones that did appear tended to be more severe than usual. The USGS is currently investigating the reasons for this. This is only the second year in which the USGS has issued a one-year earthquake forecast, so this is still new territory for the organization. Looking ahead, the USGS is hoping to learn how wastewater injection causes quakes, and improve its ability to show where ground shaking is most likely. Given that President Donald Trump has threatened to remove many restrictions limiting the actions of the energy industry, the USGS would be wise to start integrating political factors into their earthquake projections, too.